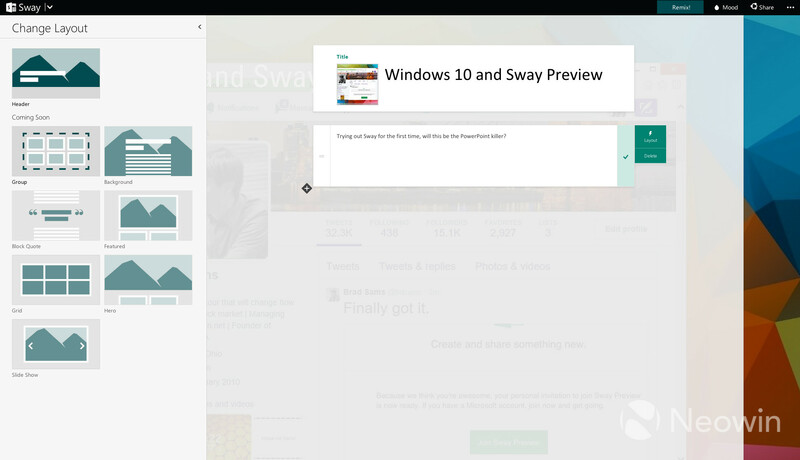 A few weeks back, Microsoft announced a new app for its Office suite, Sway. While the company showed a little bit about the app when it was announced, there were still many questions but thankfully invites for the service are now going out. We were able to get access to the new platform and while it is very early in the release cycle, we can start to get a better understanding of how the product works and its potential. 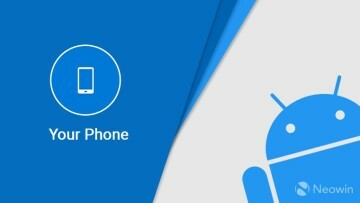 It is worth keeping in mind where the app is headed because right now, it is limited in functionality as many features are turned off. When you start your first Sway, you are instructed to pick a background image and then title the presentation. 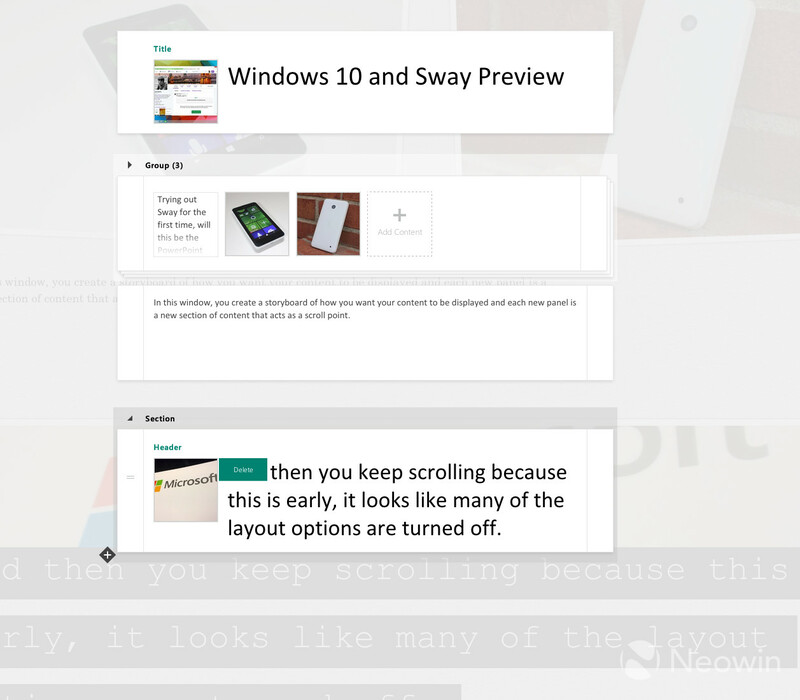 Our demo is titled "Windows 10 and Sway Preview" and you can see the awful background that I picked while trying to figure out this tool by clicking that link above. 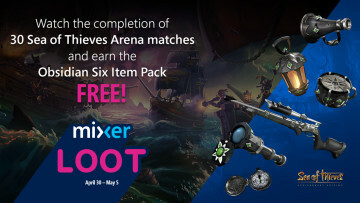 It also appears that the 'theme' that was selected did not get properly applied as there is supposed to be a solid color block behind the text on this image. After you pick your background and title, you are set free to start exploring the app. 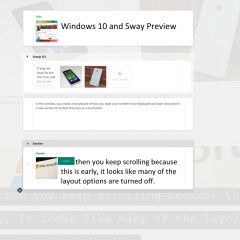 You build your Sway using the 'Storyline' on the left side where you can add and remove content. 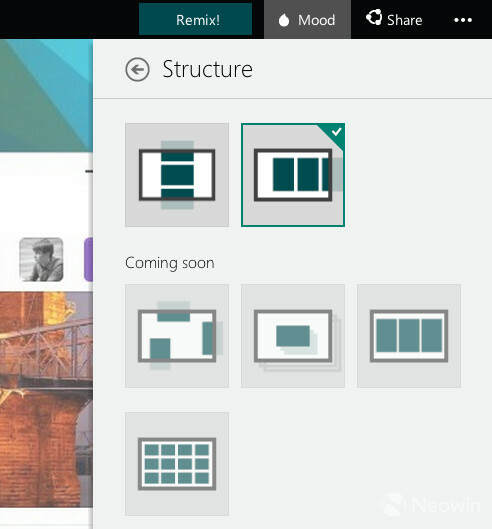 When you click on Storyline, a new panel opens that is the area where you create your presentation. 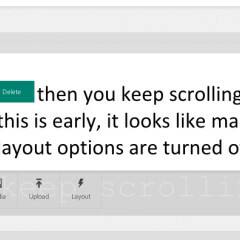 When you click the small black + sign, you are provided the options to add new content. The options are quite limited at the moment with basic text and two templates to chose from but there will be more options available in later versions of the app. 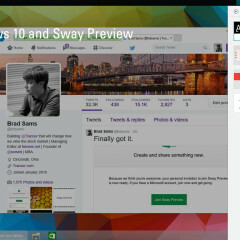 There are also multiple viewing styles that you can choose from; one is vertical and another is horizontal. 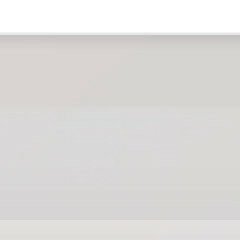 These options are under the 'Mood' tab in the top right corner and like the content templates, there are only two options at the moment but you can see that more are coming soon. 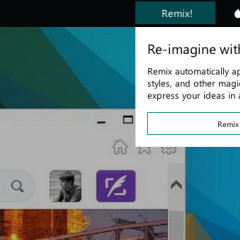 The 'remix' button is a bit odd. It will apply a random set of attributes to your presentation that change up the flow and appearance slightly. It's hard to imagine why you would create something that you like and say, 'nah, just apply some random transitions and styles' and run with it. While Sway is still in an early preview stage, there is a lot of potential here. 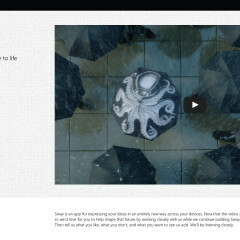 It was very easy to create a page that flows well and is responsive. While our demo that we tossed together is not the best example of what can be done as it was a learning experience for us, it does give us a flavor of how the app works and where it is headed. Frankly, this app, as it matures, will give PowerPoint serious competition and that's likely the point. Microsoft knows that PowerPoint will not go away, but at the same time, it is a proven way of presenting content for yesterday. 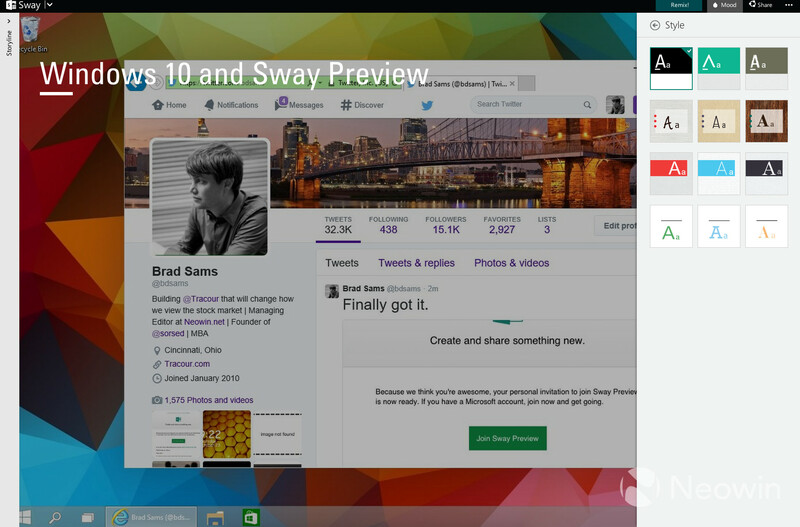 Sway is designed to be a modern way to present information on any device and the app makes that process quite easy. 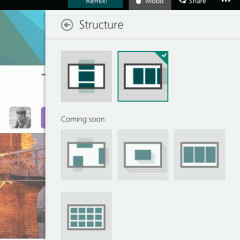 It's because it is so simple to do that we can see how it will entice users to drop PowerPoint for this modern tool. 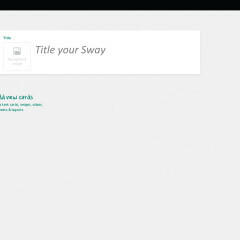 While the transition from PowerPoint to Sway will not happen overnight, given enough time, expect Sway to start working its way into the presentation workflow. Invites are still going out and you will likely get access to the app soon. 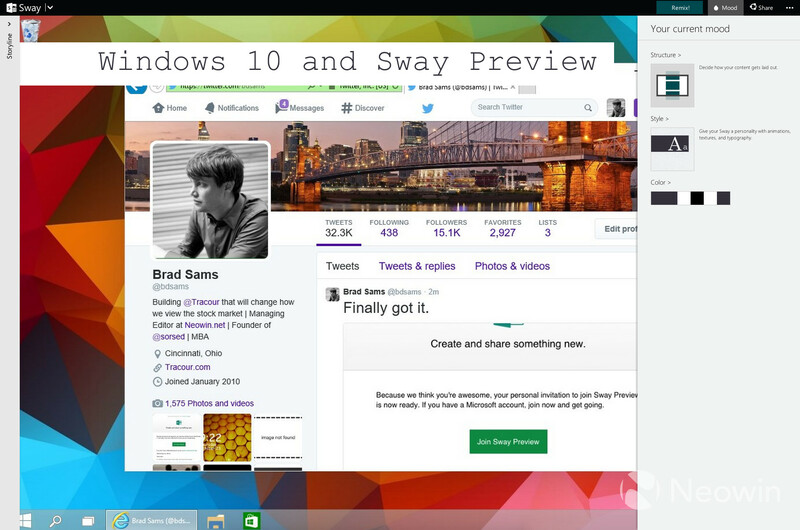 If you have questions about Sway, let us know in the comments below. 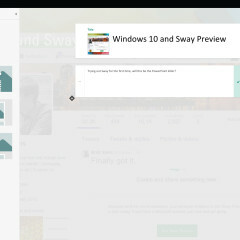 If you want to check out the Sway I created, you can do so here.